The pint-sized satellite dubbed IRVINE01 that a group of students from six Irvine high schools spent the past school year and free time building is now ready to be launched into orbit from a site in India. 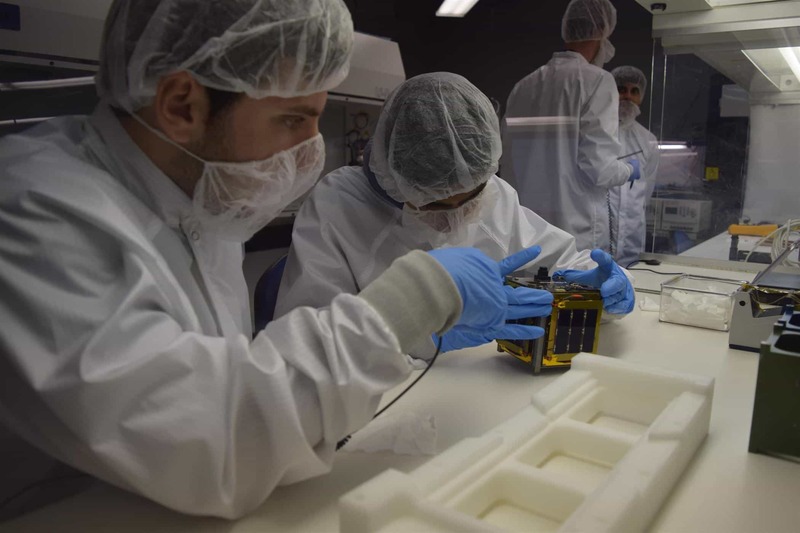 About 60 of the 150 students involved in the collaborative project gathered at Tyvak Nano-Satellite Systems Inc. on Wednesday, July 26, to watch their “baby,” what is known as a CubeSat, positioned in the orbital deployer that will carry it into space next month. The final hand-off took place at a sterile work bench inside a “clean room” at the headquarters for Tyvak, a company whose customers include government agencies and commercial clients from around the world. Security measures prevented some students with the IRVINE01 project from attending because they are not U.S. citizens. The significance of the day — captured by several news outlets — was not lost on the teens who waited for about two hours in the parking lot while a few of their teammates conducted final tests inside and prepped IRVINE01 for launch integration. “Here we are, almost two years later, and about to launch it,” said Lily Litvak, 16, who was a freshman at University High when the project began in early 2016 and is entering her junior year with thoughts about a career in science and math, possibly as an engineer. For the nanosattelite project, each school formed a team: Team Prime at University High, where Litvak participated in filling out the required applications and forms for permits and worked on the frame; Team Avionics at Beckman High; Team Communications at Woodbridge High; Team Power at Northwood High; Team Propulsion at Irvine High; and Team Biotech at Portola High. Lauren Seelig of Northwood and Vesal Razavimaleki of Beckman, who both graduated this year, were the last students to handle the CubeSat, about the size of half a milk carton with 4-inch sides and weighing 2.3 pounds, before two Tyvak engineers took over the delicate job of placing it into the deployer. Seelig and Razavimaleki donned the same attire as the engineers — static-resistant gowns, gauze hair and face nets, and sterile gloves — for their up-close observation. The other students trooped in afterward, in groups no larger than four at a time, for a look at the deployer, which also will hold two commercial satellites when it is launched in late August from a province on the eastern coast of India.